The match begun with Europa hungrily pressurising the Mons Calpe goal, pushing from the start for the lead. It could have come as early as the fifth minute but instead the game got bogged down in midfield instead with Mons Calpe going about making some tough challenges around the centre circle. But it was not too long before the breakthrough arrived. It was none other than Ibrahim Ayew who created it after returning to the game late this season due to his papers being delayed. The burly former Ghana international stormed down the right flank to deliver a perfect cross for Guille Roldan to expertly direct into the net with his head. Mons Calpe replied with a string of half-chances that rarely threatened Javi Muñoz in goal, the closest being a dipping shot from just outside the area that went just over the bar. The strong challenges continued throughout the half, with even talismanic midfielder Ivan Moya having to limp off for a time after a hefty tackle. However, the referee kept most of his cards in his pocket, at least until the second half. Ironically, it was Europa midfielder Martin Belforti who was the first to see red for a second bookable offence. 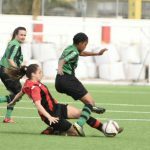 However, he was soon followed by Di Toro and Di Pietro from the Mons Calpe camp as the frustration started to boil over and the referee was having none of it. 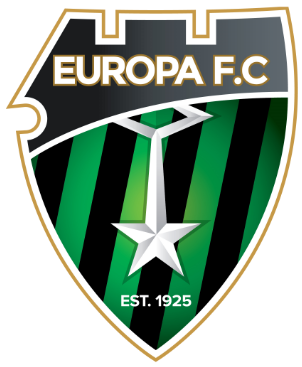 As if that was enough Europa had to endure the last ten minutes without their manager on the touchline after the referee deemed his complaints about being denied a penalty to be excessive. Johnny Parrado got his marching orders and his deputy had to take over the role. However, the Champions were able to hold on for a steely 1-0 win that reinforced their second place in the league and set them up for their next league clash with early leaders Lincoln on Thursday 15 February.